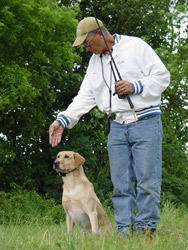 One of the most common mistakes amateur retriever trainers make is rushing the learning process. The temptation to get a young dog out in the field as soon as possible can be hard to resist. Born with an innate retrieving drive, the pup is already raring to go. 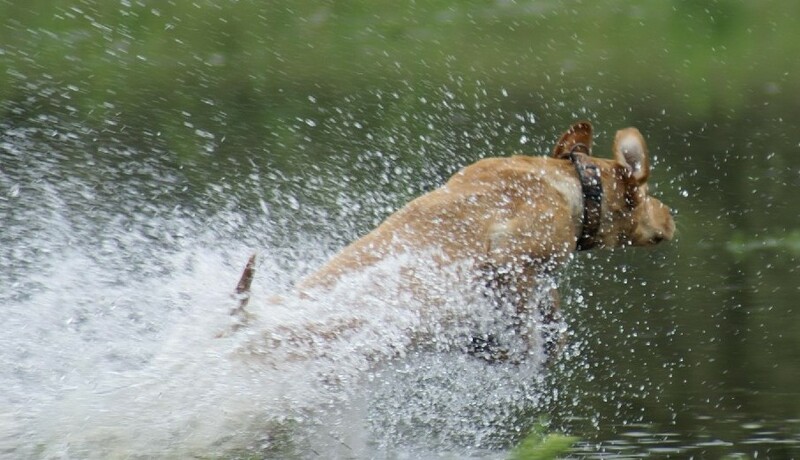 And with hunting season only months away, you may be just as eager to start running retrieving drills. Before you jump headlong into field work, however, make sure your dog has mastered the fundamentals of obedience. Be patient and take it slow. There are no shortcuts. To be able to perform advanced tasks, a retriever must first learn to follow basic commands. Repetition and consistency are the only sure ways to build understanding and trust. Some trainers use the word come instead. Whatever word you use, your dog must learn that this is an unconditional command, not a request. Get a 20- or 30-foot check cord and attach one end to your pup’s collar. Hold the other end in your hand and walk several paces away from the dog. Say the command here. If the dog does not move in your direction, begin pulling him toward you with the check cord. Be firm but not rough. Repeat this exercise several times until the dog learns to come to you without hesitation. Remove the check cord and repeat the exercise again. Praise the pup when he does well to help make this lesson as much fun as possible. This command can be incorporated into your pup’s feeding regimen. Hold the food bowl in one hand and say sit while pushing down on the dog’s rear end with your other hand. When the dog sits, place the bowl in front of him on the floor. The pup will quickly learn that the reward for sitting is food, which is a great motivator. You can teach stay as an extension of the sit command. While the dog is sitting, hold your hand out toward him with your palm facing outward and say stay. Walk away, wait a minute, then call the pup to you. Gradually extend the length of time the dog remains in the sitting position. If the pup breaks and runs to you without being called, take him back to the spot where he was originally sitting and start the lesson over again. Never allow your dog to think that staying put is optional. He should remain in place until released. This lesson is easy. When putting your pup in his crate, simply say kennel. Once the dog learns to associate this word with entering the friendly confines of his kennel, you can use it when loading him into a vehicle, boat, dog hide, blind, and other such places. The key is to make the crate as attractive as possible from the get-go. You can do this by placing a blanket and a treat inside to entice your puppy to enter it. Your retriever should be trained to walk at your pace and not drag you down the street. That’s the purpose of the heel command. Begin walking with your pup on a lead. He should always be on your left side. When he quickens his pace and pulls ahead, say heel and pull him back toward you with the lead. Repeat this lesson each time he moves ahead of you. If you stop walking, your dog should stop and sit down beside you. This command should be used to discourage undesirable behaviors such as chewing on furniture, jumping on people, messing in the house, and similar indiscretions. Be sure to say it loudly and emphatically. Your dog should not have any doubt about what you mean when you say no. In no time you and your retriever will be working together & what a hunting team that will be!